Some time in the next few weeks—by the end of the year, agency officials say—NASA will announce the finalists for the next mission in its New Frontiers program of medium-sized planetary science missions. Out of the dozen proposals received earlier this year, NASA is expected to select three of them for additional study, choosing one in the spring of 2019 for launch by 2025 (see “The missions proposed for the New Frontiers program”, The Space Review, October 9, 2017). “I think many of you share my feeling that NASA passed by an opportunity to take a new direction and reengage in some fundamental questions of comparative planetology that Venus uniquely provides,” said Grimm. Among those watching anxiously for the New Frontiers announcement will be those planetary scientists who study Venus. A year ago they had high hopes for winning approval for NASA’s first mission to the planet since Magellan, more than a quarter-century ago. Two of the five finalists in the competition for the Discovery program of less-expensive planetary spacecraft were Venus missions. With NASA planning to select two missions at once, the odds were good that one of them would be a Venus mission. The odds, alas, were not good enough. NASA instead picked two missions to study asteroids, Lucy and Psyche, while also providing funding for an asteroid-hunting space telescope, NEOCam, to allow for additional mission studies. The two Venus missions in the competition, DAVINCI and VERITAS (see “For planetary scientists, Venus is hot again”, The Space Review, December 12, 2016), were left out. “I think many of you share my feeling that NASA passed by an opportunity to take a new direction and reengage in some fundamental questions of comparative planetology that Venus uniquely provides,” said Robert Grimm, a Southwest Research Institute planetary scientist who chairs the Venus Exploration and Analysis Group (VEXAG), at the group’s annual meeting last month at the Applied Physics Laboratory. Part of that rebound has to do with the New Frontiers competition: three of the mission proposals submitted involve orbiter or lander missions to Venus. However, Grimm said at the meeting that Zurbuchen opened the door to another type of mission, far smaller than a New Frontiers or Discovery mission. NASA, earlier this year, awarded a number of studies for its Planetary Science Deep Space SmallSat (PSDS3) program. These studies are intended to explore the feasibility of using smallsats, from 180 kilograms down to CubeSats, for various planetary science missions. The awards included four concepts for missions to Venus. That led to an ongoing study called Venus Bridge to look at the feasibility of linked smallsat missions to Venus, including their ability to perform useful science and fit within that $200 million cost cap. The studies, briefed at the VEXAG meeting, are still ongoing, but those involved sounded optimistic about their outcome. “We think that there’s strong science that can be done,” Grimm said. “The $200 million cap can be met with programmatic considerations.” Those “programmatic considerations,” he said, included whether you include launch and operations cost within the cap or treat them separately, as is often the case with other missions. A balloon mission, he said, may be harder, since is appears difficult to fit one into an aeroshell 56 centimeters across, a size constraint for flying as a rideshare mission. The other study, called Venus Bridge Orbiter and Surface System (V-BOSS), is examining a specific design for a coupled orbiter and lander mission to see if the overall concept is feasible, said Gary Hunter of NASA Glenn. “In order to know if we could make $200 million, we had to go through a point design,” he said, adding there are various options that can also be considered for such a mission. The V-BOSS concept his team is looking at involves an orbiter and a lander to study mineralogy and surface-atmosphere interactions. It takes advantage of high-temperature electronics being developed and tested at Glenn to allow for the lander to operate for an extended period on the surface. In this mission, V-BOSS would launch as a secondary payload on a mission towards the Moon in 2025, and make flybys of both the Moon and Earth en route to Venus. The lander, weighing about seven kilograms, would separate from the orbiter about 30 days before arrival. The lander would collect data during descent and after landing, transmitting it to the orbiter to relay to Earth. The orbiter, in addition to being a communications relay, would take infrared images of the Venus. The cost model presented at the VEXAG meeting has an overall estimate for V-BOSS of $202 million, which includes reserves of 25 percent. It does not, he said, include launch and operations costs. The two studies will continue into early next year. What happens after that, particularly if the studies do conclude that such missions can do useful science within the $200 million cost cap, isn’t clear. Grimm said he believes that Zurbuchen, who was an advocate of the use of cubesats for science missions before joining NASA last year, is sincerely interested in finding a way to back a smallsat Venus mission program. The Venus Bridge studies do provide new optimism for scientists after the loss of the Discovery competition. At the very least, the future of NASA-funded missions to Venus is not riding on the outcome of the New Frontiers competition, where Venus missions face stiff competition from proposals ranging from a lunar sample return spacecraft to explorations of the moons of Saturn. Yes, some people had these dreams! But the yellow planet should be left alone for at least a few million years. Night on Venus in infrared, from orbiting Akatsuki. The most recent time NASA launched a mission to Venus was in 1989. The Magellan orbiter lasted four years, transmitting data back to Earth that had to be recorded onto physical tapes. These were archaic times. The generation-long drought of missions solely intended to study Venus was extended further last Wednesday, when NASA selected two projects as finalists for a mid-2020s science mission. None of the three Venus projects were chosen. One did receive additional funding for more research and development, but it will have to wait till the next application cycle to contend again for mission selection. Venus is an 850 degree Fahrenheit extraterrestrial hell, covered in a dense atmosphere of sulfuric acid. The general public might be more or less ambivalent to such a decision, but within the scientific community, there’s plenty of lamenting that Venus continues to draw the short straw when it comes to NASA’s science program. But NASA is right. It’s time to let go of Venus. There have always been good reasons to conduct missions to Venus: Earth and Venus share comparable sizes, densities, and overall geographies, and many scientists believe Venus represents a sort of glimpse into an alternate reality of what Earth could have turned out to be. While our planet is a warm, loving environment that’s allowed life to evolve and thrive, Venus is an 850 degree Fahrenheit extraterrestrial hell, covered in a dense atmosphere of sulfuric acid and surface pressures that we only see on Earth at depths of about 1 kilometer underwater. When previous missions have gone to Venus, they’ve been searching for clues that could explain how some planets transform into habitable worlds, and others don’t. That information could be very useful for understanding what other worlds and directions we ought to focus our attention on. But there are two major reasons it’s time to move on from Venus. The first is cost and accessibility. Jim Green, the director of NASA’s Planetary Science Division, told reporters last Wednesday that going to Venus is still an incredibly difficult venture. The planet’s hellacious environment is a destructive force. Spending millions or billions of dollars on a lander that can’t last more than a few hours is a hard sell against projects that can study other worlds for several years on end, like Mars or Saturn’s moon Titan. Scientists are making strides in computer chips and technologies that could handle Venus, but a working lander or rover is still very far in the future. We could stick to orbiters and be safe, but there’s only so much you can learn about a place from high above. The second reason to ignore Venus harkens back to what NASA is more interested in these days: extraterrestrial life. NASA is pivoting its science program deeper into astrobiology to find worlds that could be habitable to life—be it by humans or aliens. Mars, for instance, is a place we will certainly set foot on one day, and there are high hopes we could find signs of past or present microorganisms on the planet. Ocean worlds, like Saturn’s moons Titan and Enceladus and Jupiter’s moon Europa, also possess subsurface liquid oceans that might be breeding grounds for lifeforms. And even though these worlds are freezing, habitat technologies that keep colonists warm and fuzzy are already conceivable. If we can eventually perfect terraforming technologies, we could warm these worlds up so they’re more amenable to future denizens. Venus is not like that. It’s almost certainly lifeless in its current state. We can’t even get simple instruments on Venus to survive for more than a few hours before they melt and combust. It’s almost unthinkable humans will ever set foot on the surface. And terraforming as we currently think about it means warming a planet up (which we’re pretty experienced at! ), not cooling it down. If Venus ever decides to chill out, it will be millions or billions of years from now, as a natural process. It’s sad to say, but Venus is more of a sideshow when it comes to planetary science these days. It might be time to accept we won’t be visiting the yellow planet for quite a long time. Let’s give ourselves a moment to mourn, and move on. BLUE MARBLE From the outside, you would never know how hostile Venus’ surface is. 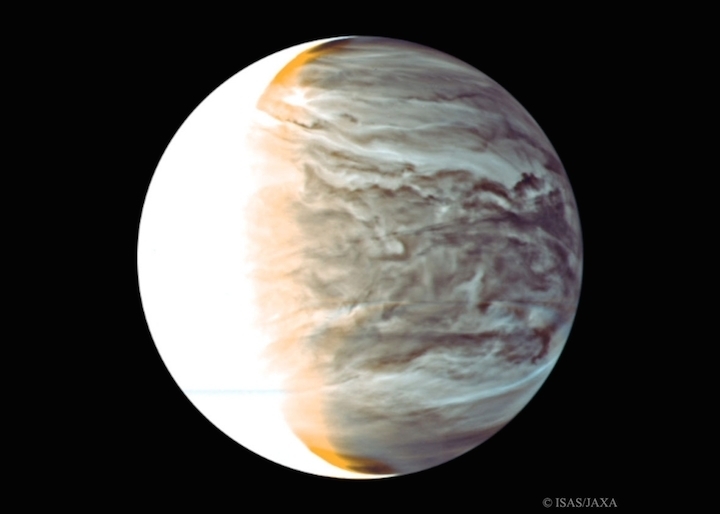 This false-color image of Venus from the Akatsuki spacecraft shows a cloud-covered atmosphere as complex and dynamic as Earth’s. There’s a planet just next door that could explain the origins of life in the universe. It was probably once covered in oceans (SN Online: 8/1/17). It may have been habitable for billions of years (SN Online: 8/26/16). Astronomers are desperate to land spacecraft there. No, not Mars. That tantalizing planet is Venus. But despite all its appeal, Venus is one of the hardest places in the solar system to get to know. That’s partly because modern Venus is famously hellish, with temperatures hot enough to melt lead and choking clouds of sulfuric acid. “If you wanted sinners to fry in their own juice, Venus would be the place to send them,” V. S. Avduevsky, deputy director of the Soviet Union’s spaceflight control center, said in 1976 after his country’s Venera 9 and 10 landers returned their dismal view of the planet’s landscape (SN: 6/19/76, p. 388). And researchers are actively developing more Venus-defying technology while vying for the financial support needed to get a mission off the ground. In 2017, five Venus projects — including a mapping orbiter, a probe that would taste the atmosphere as it fell through it, and landers that would zap rocks with lasers — failed to get NASA’s green light for flight. But all were considered technologically ready to go, and the laser team got funding for technology development. HELL ON EARTH The Glenn Extreme Environment Rig (GEER) at NASA’s Glenn Research Center in Ohio can create Venus-like conditions in a controlled space. From afar, Venus and Earth would look like equally promising targets in the search for alien life. Both are roughly the same size and mass, and Venus lies close to the sun’s habitable zone, where temperatures enable stable liquid water on a planet’s surface. 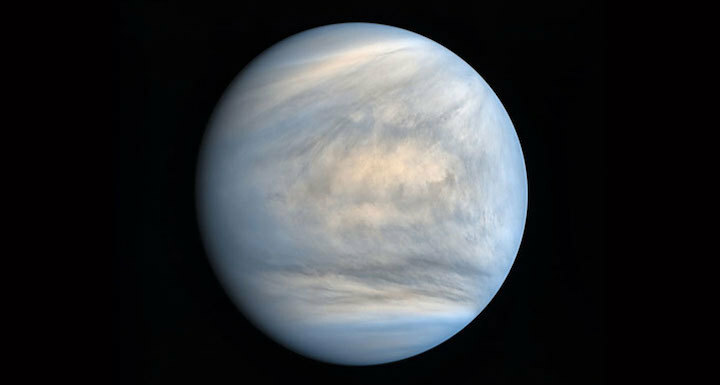 “We need to understand what made a planet go down the Venus path rather than the Earth path,” says astrobiologist David Grinspoon of the Planetary Science Institute, who is based in Washington, D.C.
A few orbiters have visited Venus in the past decade, including the European Space Agency’s Venus Express from 2006 to 2014, and the Japanese space agency’s Akatsuki, in orbit since December 2015. But despite dozens of proposed missions spanning almost 30 years, no NASA spacecraft has visited Earth’s twin since the Magellan craft ended its mission by plunging into Venus’ atmosphere in 1994 and burning up. And no spacecraft at all have landed on the Venusian surface since 1985. One obvious barrier is Venus’ thick atmosphere which, in recent images from Akatsuki, makes the planet look like a smooth, milky marble. The atmosphere is 96.5 percent carbon dioxide, which blocks scientists’ view of the surface in almost all wavelengths of light. As recently as 2011, astronomers thought it was impossible to use spectroscopy — a technique that splits light from an object into different wavelengths to tell an object’s composition — from orbit to reveal what Venus’ surface is made of. But it turns out that Venus’ atmosphere is transparent to at least five wavelengths of light that can help identify different minerals. Venus Express proved it would work: Looking at one infrared wavelength allowed astronomers to see hot spots that might be signs of active volcanism (SN Online: 6/19/15). An orbiter that used the other four wavelengths, too, could do even more, Dyar says. To really understand the surface, scientists want to go there. But a lander would have to contend with the opaque atmosphere while looking for a safe place to touch down. The best map of Venus’ surface, based on radar data from Magellan, is too low-resolution to show rocks or slopes that could topple a lander, says James Garvin of NASA’s Goddard Space Flight Center in Greenbelt, Md. Garvin and his colleagues are testing a computer vision technique called Structure from Motion that could help a lander map its own landing site on the way down. Quickly analyzing many images of stationary objects taken from different angles as the spacecraft descends can create a 3-D rendering of the ground. A tryout in a helicopter over a quarry in Maryland showed that the technology could plot boulders less than half a meter across, about the size of a basketball hoop. “With a handful of GoPro pictures, we made beautiful little topographic maps,” Garvin says. “We can do it at Venus even with this crappy atmosphere that is so murky you wouldn’t think it works.” He plans to present the experiment in March in The Woodlands, Texas, at the Lunar and Planetary Science Conference. Once a lander has made it to Venus’ surface, it faces its next challenge: surviving. The first landers on Venus, the Soviet Venera spacecraft in the 1970s and ‘80s, lasted around an hour each. The longevity record set by Venera 13 in 1982 was two hours and seven minutes. The planet’s surface is about 460° Celsius and its pressure is about 90 times that of Earth’s sea level, so spacecraft don’t have long before some crucial component is melted, crushed or corroded by the acidic atmosphere. Modern missions are not expected to do much better: one hour minimum, five hours optimistically and 24 hours “in your wildest dreams,” Dyar says. But a team at NASA’s Glenn Research Center in Cleveland is designing a lander that could last months. “We’re going to try to live on the surface of Venus,” says engineer Tibor Kremic of NASA Glenn. THROUGH THE FIRE Electronics subjected to Venus-like conditions of 460° Celsius and 90 times Earth’s pressure emerged charred but operational after a 21.7 day test. Instead of using bulk to absorb heat or countering it with refrigeration, the proposed lander, called LLISSE (Long-Lived In-Situ Solar System Explorer), would use simple electronics made of silicon carbide that can withstand Venusian temperatures. 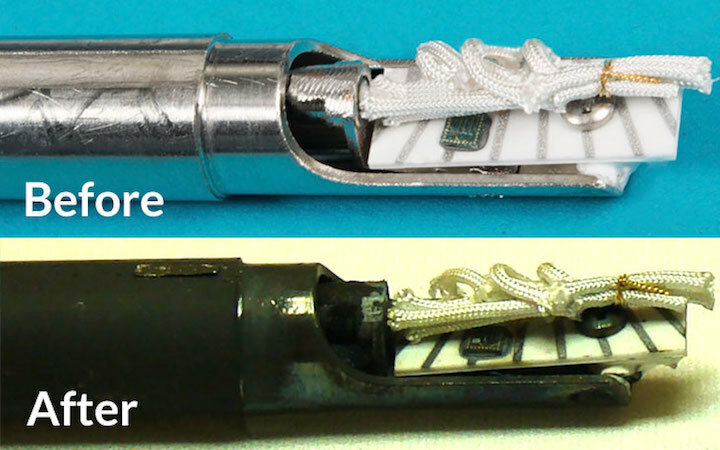 “They’re not Pentiums, but they’re able to provide a reasonable amount of functionality,” says NASA Glenn electronics engineer Gary Hunter. The group has tested the circuits in a Venus simulation chamber called GEER (Glenn Extreme Environment Rig). “Think of a giant soup can,” but with 6-centimeter-thick walls, Kremic says. The circuits still worked after 21.7 days in a simulated Venus atmosphere, reported Philip Neudeck of NASA Glenn in AIP Advances in 2016. Scheduling issues put an end to the experiment, but the circuits could have lasted longer, Hunter says. Ultimately, the team wants to build a prototype lander that can last for 60 days. On Venus, that would be long enough to act as a weather station, monitoring changes in the atmosphere over time. “That has never been done before,” Kremic says. And that presents the next challenge: Planetary scientists have to figure out what the data are telling them. Rocks interact with the Venusian atmosphere differently than with Earth’s or Mars’ atmospheres. Mineralogists identify rocks based on the light they reflect and emit, but high temperature and pressure can shift light in ways that depend on the mineral’s crystal structure. Even when scientists get data on Venusian rocks, interpretation could be tricky. “We don’t even know what to look for,” Dyar says. Ongoing experiments at GEER are helping set the baseline. Scientists can leave rocks and other materials in the chamber for months at a time just to see what happens to them. Dyar and her colleagues are doing similar experiments in a high-temperature chamber at the Institute of Planetary Research in Berlin. “We try to understand the physics of how things happen on the Venus surface so we can be better prepared when we explore,” Kremic says. By simulating Venus-like conditions, researchers in Germany are working on how best to collect and interpret data from a future mission to the planet. At left, a stainless steel cup holding a hockey puck‒sized disk of minerals glows as the heat inside a chamber gets cranked up to 480° Celsius. That glow muddies efforts to analyze the minerals based on the light they emit. At right, a new kind of ceramic is barely visible under the same conditions, so interferes less with the analysis. Two of the mission concepts NASA didn’t green-light use different strategies. VISAGE (Venus In-Situ Atmospheric and Geochemical Explorer) proposed bringing powdered rocks into a chamber inside the lander that maintains Earthlike conditions and measuring them there. VICI (Venus In-situ Composition Investigations) takes a hands-off approach: Shoot rocks with a laser and analyze the resulting puff of dust. The Mars Curiosity rover uses that technique, but the density of Venus’ atmosphere might make the results harder to understand. The team is testing the technique in a Venus simulation chamber at Los Alamos National Laboratory in New Mexico. There’s hope on the horizon, if Venus explorers can shrink their ambitions. Last year, NASA established a program called Venus Bridge to see if any missions to Venus can fly for $200 million or less. That figure is less than half the cost — and in some cases much less than half — of recently proposed missions. In the meantime, the Venus hopefuls soldier on.